Every once in a while you get hit by an amazing piece of artwork. I’m talking about a stop-you-in-your-tracks piece of art. That’s what happened to me at the end of this summer’s retreat, when one of my colleagues passed in her STEAM advocacy piece for one of the retreat course assignments. Her work so moved me, that I needed to share it with you. In addition, Deb Hewey, who is the EL teacher at my school in Amesbury, MA, allowed me to share with you her process in creating it. How special! And so, I share her work AND process with you in the hopes it will inspire you the way it did me and the other retreaters this summer. I really spent a lot of time thinking through how I would promote art integration in this advocacy assignment. The one thing I did know from the start is that it would be accomplished as a mixed media piece. The most helpful resource for me to actually begin brainstorming was Elizabeth’s video recording “Arts in Steam”. I appreciated the reminders of Leonardo DaVinci’s life and accomplishments but the 9 Muses really caught my attention. I didn’t remember that they were part of Greek mythology. I also particularly liked the reference to art being in partnership with STEM. That just reinforced the idea that it is equal to the others and not just something to add on top of an activity – you know, fold it in like the blueberries. But when it came down to it – the Muses took over my brain. I considered the arts they represented and felt some of them overlapped each other. That led me to wonder what categories of arts are mostly referred to in STEAM and I found a list of “the 7 arts”: architecture, music, performance, sculpture, painting, dance and poetry. I started thinking maybe they are the superheroes of STEAM (kinda destroys the idea of a partnership though). But superheroes got me thinking about how we want our kids to wonder . . . and, well, you know where that leads . 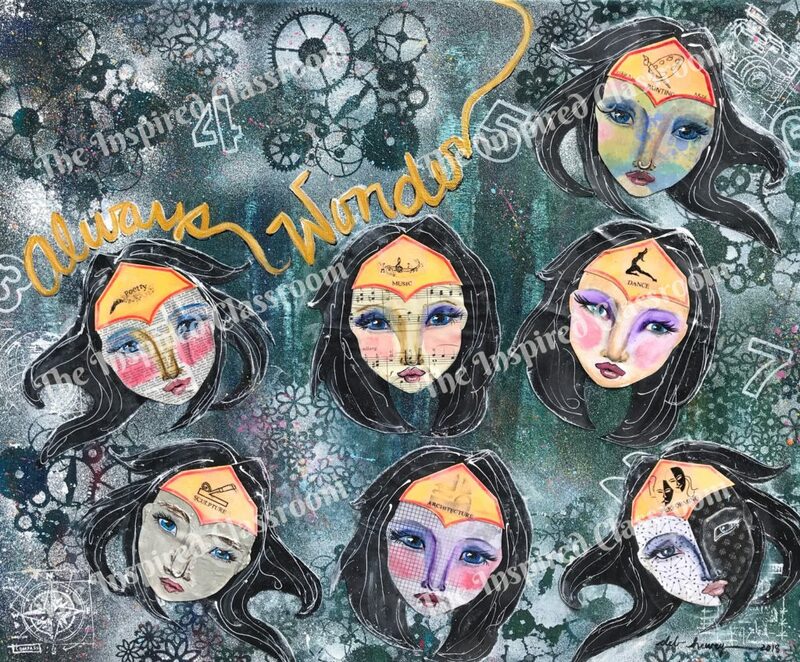 . .
“Always Wonder” is a 24”X30” mixed media collaged canvas. I used acrylic paint, inks, watercolor pencils, neocolor pastels, stencils, stamps, paste, mod podge and varied paper types. The background canvas has layers of paint but the observable images in white represent the elements of STEM. The 7 wonder woman faces are our “modern day muses”. Each one is drawn and painted on paper that I felt characterized its labeled art form and was then collaged onto the canvas. The headband of each contains an image I felt represented that kind of art. I added “visual arts” to “painting” as I couldn’t see which art all of the photography we practiced last week would fall under. Each of my “muses” can be supported by the following quotes by Eric Jensen in his book ARTS WITH THE BRAIN IN MIND. 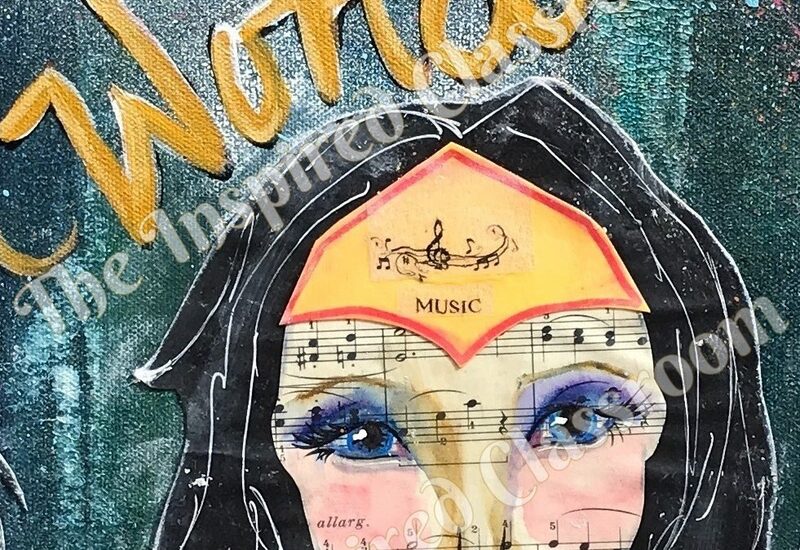 Perhaps instead of muses inspiring art they should be considered as muses that inspire life long learners, wholeness, knowledge, social emotional practices, good listeners, . . . STEM alone can’t boast all of that! I love reading about Deb’s thought process as she created this piece. This is a true testament to the power of how the arts deepen our understanding of ideas and concepts. Through this creation, she sorted through research, discovered new angles on an idea and solidified her own thoughts about STEAM. Never underestimate the power of art creation and of working in and through the arts! P.S. I look forward to sharing other retreaters’ responses to this same assignment. A true reminder of how talented teachers are! !